The dealer is charging a hefty premium to become one of the first owners of the new Mercedes G-Class. Less than a week after the , German dealer is already selling a brand new model. But becoming one of the first owners of the reborn G-Wagon will cost you a hefty premium. The dealer is selling the SUV for €133,600 ($163,476), yet Mercedes says the starting price in Germany will be €107,040.50 ($130,977) when it goes on sale in June. US prices have yet to be announced. Sadly, it’s not uncommon for dealers to put high mark-ups on sought-after models that are high in demand like the popular G-Class. Of course, the new 2018 model hasn’t even entered production yet, but the dealer is promising a build slot for an already commissioned example. 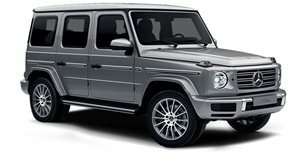 The G-Class for sale is listed as a G500 series, which is currently the only model available in the 2018 G-Class range. It’s powered by a 4.0-liter V8 gasoline engine developing 416 horsepower and 450 lb-ft of torque that’s paired with a nine-speed automatic transmission. While it looks similar to the old model retaining the SUV’s signature boxy shape, it represents the first major redesign in the model’s history. It combines premium luxury features with the rugged off-road prowess the G-Class is renowned for, featuring an and a ladder-type frame that makes it even more capable off-road than before. The G-Class the buyer will receive the model finished in Obsidian Black and sitting on a set of 20-inch AMG wheels. Inside, the G Wagen features brown upholstery and wood trim, along with a plethora of optional extras including the Driving Assistance Package, 360-degree camera system, ambient lighting, Burmester premium sound system, rear entertainment system and a sunroof.